Oceanstyle by Burgess tell me that the Miami, Florida, office has listed the petite 22.9m motor yacht Ares for sale. 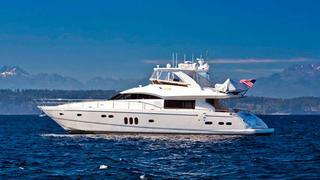 Built by Viking in 2006, Ares has been regularly upgraded by her experienced owner. Accommodation is for eight guests in four staterooms, and there is a full warranty on her Caterpillar C-32 engines. Lying in Seattle, Washington, Ares is asking $2,950,000.